The MCP1602 is a high efficient, fully integrated 500 mA synchronous buck regulator with a power-good monitor. The 2.7V to 5.5V input voltage range and low quiescent current (45 µA, typical) makes the MCP1602 ideally suited for applications powered from 1-cell Li-Ion or 2-cell/3-cell NiMH/NiCd batteries. 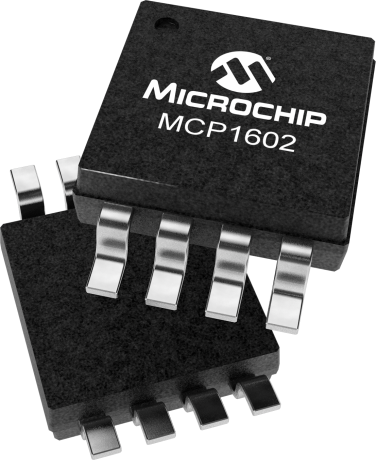 At heavy loads, the MCP1602 operates in the 2.0 MHz fixed frequency PWM mode which provides a low noise, low output ripple, small-size solution. When the load is reduced to light levels, the MCP1602 automatically changes operation to a PFM mode to minimize quiescent current draw form the battery. No intervention is necessary for a smooth transition from one mode to another. These two modes of operation allow the MCP1602 to achieve the highest efficiency over the entire operating current range. The open-drain power-good feature of the MCP1602 monitors the output voltage and provides indication when the output voltage is within 94% (typical) of the regulation value. The typical 2% hysteresis in the power-good transition threshold as well as a 262 ms (typical) delay time ensures accurate power good signaling. The MCP1602 is available in either the 8-pin DFN or MSOP package. It is also available with either an adjustable or fixed output voltage. The available fixed output voltage options are 1.2V, 1.5V, 1.8V, 2.5V and 3.3V. Additional protection features include: UVLO, overtemperature, and overcurrent protection.